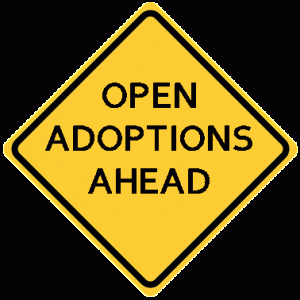 Once I had my preliminary research on public and private adoption, the next thing I started looking into was open adoption. Open adoption was probably the first thing and only thing that I objected to when I first read about it. It made me squeamish, it felt awkward, and impossible. The more I read about it though, the more I gradually came around. I’m going to explain in my next entry how that came to be, but today’s blog is another lesson in adoption. I’m going to explain open adoption and the other degrees of openness that adoption can sometimes include. So get your pens and notepads ready. Let’s begin…. In both private and public adoption, there are various degrees of openness between the adopted child, birth parents and adoptive parents. Adoption is no longer kept in the shadows. It isn’t something families refuse to speak of because it’s some shameful dark secret. Things have changed since the days when unplanned pregnancies resulted in a woman leaving town to “stay with family”, while her secret was taken care of, and she was sent back home and told that it was best for everyone involved if she just forgot it ever happened. Yes, it’s come a long way since then, thank goodness. Today, many adopted children not only know who either or both of their birth parents are, but they also have open relationships with them where there are varying degrees of contact and information exchanged. Some even have the same knowledge of, and relationships with, siblings and their extended family as well. Like me, this may come as a shock to some of you as you hear this for the first time. That seems to be a common reaction. If that’s your reaction, I hope that once I explain how it works and the reasoning behind it, you become more open to it as I did. So what is openness in adoption? Openness is the amount of contact and information that the birth parents, adopted child, and adoptive parents have within their relationship. As I mentioned, the degree of openness can vary depending on circumstances. Back in the earlier days of adoption when it was taboo, all adoptions were closed. This meant that children were given no information about their birth parents, nor were the adoptive parents. That is if the adoptive children had knowledge of their adoption at all. (Everything that’s wrong with that, is material for another class on it’s own.) Gradually, over time, some openness was allowed with some agencies, but still with limitations. No identifying details were shared, just very basic personal characteristics and medical/hereditary information. Today, this still happens, but very rarely. From here out, I’m going to use just the birth parent for explanation purposes, but this relationship can encompass just the birth mother, the birth father and/or extended family as aforementioned. A semi-open adoption is when the birth parents have interactions with the adoptive parents and child, that entails non-identifying interactions. The identity of all parties is usually not shared, and contact is, most often in the form of letters, cards, and sometimes emails. Contact is usually mediated with the help of an adoption worker, or attorney, depending on whether it’s a private or public adoption. In open adoption, both the birth parents and adoptive parents as well as the child, have a completely open relationship in the sense that identities are known on all sides. Contact varies from adoption to adoption, but it can be anything from letters, phonecalls or photos, to face-to-face visits. These visits can be once a year, or frequent and regular get-togethers. They may include casual meet ups at home, the park, or family gatherings for holidays and special occasions. How the degrees of openness are defined and executed are the same whether you go through the private or public adoption process. What does differ between the two adoption options, is how the degree of openness is set. There are no stats out there to say which adoption method offers more openness over the other, because it’s the circumstances which dictate what degree of openness occurs. In private adoption, the adoption is birth parent driven. The birth parents choose to place their child for adoption, and in most cases choose the adoptive parents for their child. The decision is theirs as to where on the openness spectrum they choose to place their relationship with their child and the adoptive parents. In public adoption, the adoption is most often due to severance of parental rights. There are a number of reasons children are placed for adoption with child protective services; abuse, neglect, inability to parent, a death in the family, and sometimes (though not as often), parents willingly relinquish their rights. In this method, usually the courts dictate what level of parental contact there will be. The degree to which it is exercised within the legal boundaries can still be the choice of both sets of parents, but it is not entirely in the hands of the birth parents as it is with private adoption. Both methods can still impose a closed adoption option. In both private and public adoption, the birth parents may find it too painful to remain in contact, and opt for a closed adoption. But in public adoption, sometimes, regardless of the birth parent’s wishes, the court deems a closed adoption the best option for the safety and well being of the child. So now you know the definitions, but how does this all work? How can you adopt a child, and as their parent, potentially share their life with their birth parents? Why would you want to? Ask a lot of adoptive parents, and they will tell you they had the same reaction that I did when they first learned about open adoption. They didn’t want to even entertain the thought. It made them uncomfortable. Would they be co-parenting this child? How could they face their child’s birth parents and share their child’s life without feeling guilty for taking them away from them? Alternatively, how can they have a relationship with the person who may not have taken proper care of their child, or worse? What if the birth parents didn’t like them or their parenting methods? Or worse, what if their child liked their birth parents better? So many questions, and the answer doesn’t address any of them. The answer is that it isn’t about the birth parents or the adoptive parents. It’s completely about the child, and their well being. The reason closed adoptions are no longer the only way is because a child needs to know where they come from, no matter how or when their journey into adoption begins. Even a child adopted from birth recognizes when they are taken away from their birth mother. They have spent nine months surrounded by her body, her smell, and her voice, and then suddenly removed and placed in the arms of strangers they have no connection to. Children adopted at an older age will already have memories of their birth parents. They may not all be good memories, but they are the child’s history, nonetheless. The clarity of older an adoptee’s memories will vary depending on their age when they leave their birth family, but they will be there, regardless. But those memories are finite. They will stop before their memories with their birth family begin. There is a huge gap, that no amount of love, care and nurturing can fill. An adoptee’s need for their history is as personal as their adoption story is. I’m not going to pretend to know the desire behind the need to know who your parents are. I’m not an adoptee, so I can’t even begin to speak with an authentic voice, and wouldn’t deign to try. However, I do have personal experience witnessing someone who doesn’t have their complete history, and the anguish it caused them for many, many years, and still does on some level. I have seen the pain of just not knowing where you came from. Of having a part of you missing. I don’t expect my words to sway you if you’re not at the point of accepting open adoption as a viable option for you and your future family. But I do hope that I might sway you toward keeping an open mind and doing your due diligence and learning more about the benefits of open adoption. I know personally, I want my children to look back on a life that was the best I could give; I want them to have laughter, infinite unconditional love, and a safe place to fall. The one thing I can’t give them is their life, but that doesn’t mean I can’t give them a relationship with the person who did. You are such an excellent writer! Very informative! Thanks D! Trying to make it easier for those starting out, by getting to as much info and personal experience as I can in one place. I know how much searching and surfing there is involved and hope it helps someone with their journey.